“Uruoi Sengen” means ” I declare to keep moisture in the skin” in English. 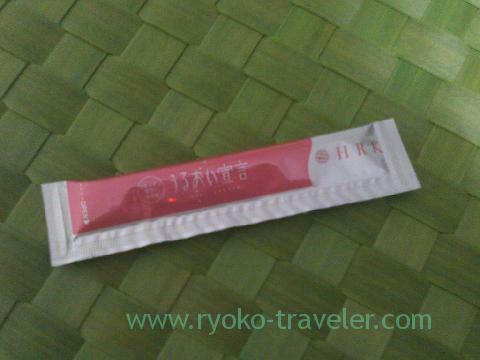 I had been wanting to try such jelly sticks containing collagen. I found I can get the three sticks without charge by the internet. So I ordered it soon. This tasted strange a bit. But this is small in quantity, so I don’t feel difficulty a lot in having it. Most collagen drinks are large in quantity. And difficult to drink. I used it for three days, but there is no effection. In the first place, it seems there is no vital reaction in my skin, I don’t feel my skin alive. Is there any sebaceous glands in my skin ?